Hairy manzanita is a stunning addition to a dry, sunny site. 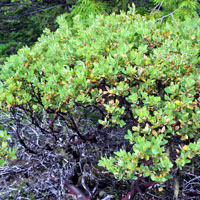 This broad-leaved evergreen shrub has greenish-gray leaves and a deep; reddish brown colored trunk. Although not particularly common, hairy manzanita is found sporadically through out the Puget Sound area.